What does "handicapping" a horse race mean? The simple answer is that handicapping is the art or science of selecting a winning horse based on the information that is available to you before the race. The information that you use to handicap a race is found in the Past Performances. 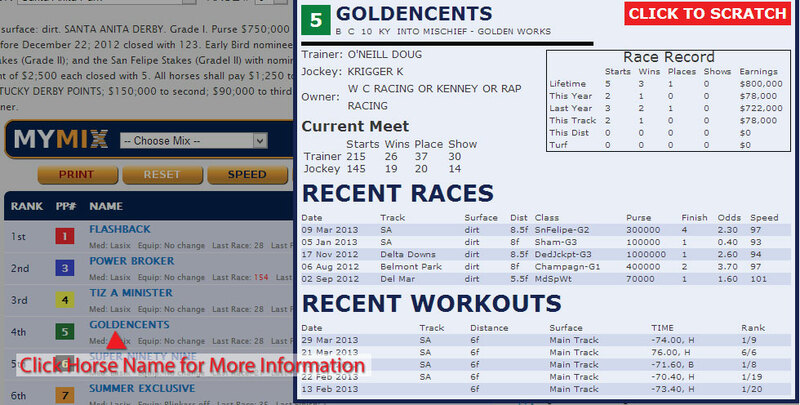 Past Performance information contains details about the horse, trainer and jockey. Normally, people look at the track program or Daily Racing Form to get this information, and if you are new to handicapping it can be a bit overwhelming to decipher all of the information. Even if you are an expert it can be difficult to compare one horse against another and determine who has the best chance of winning the race. Betmix allows you to do this very easily and with great accuracy. 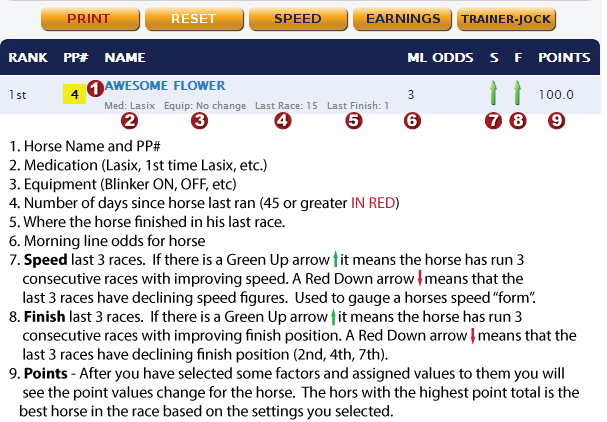 Betmix allows you to choose from several handicapping factors, and assign a value to those factors. Once you have created a Mix you can name that mix and apply it to future races. The key to becoming a successful handicapper is to use a Consistent Handicapping Method. Betmix allows you to do that, and you will be amazed by the results. The best way to get started is to try out the Free Race of the Day. You will see a screen just like the one below that contains information about each horse in the race. To the right and left of the results screen you will see a list of handicapping factors, to use a factor turn it ON and then give it a value. In this example we have three handicapping factors turned on. Best Lifetime Speed (set at 50), Best Speed Number at today's track (set at 30) and Best Speed Distance (set at 20). You can turn on as many factors as you want and set the values to whatever you want them to be. The higher the values, the more importance the computer will give to that factor when ranking the horses. It is sometimes easier to think about how to set your factors if you think in terms of 100. 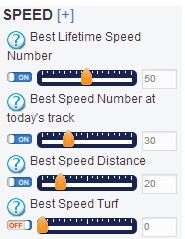 In our example we have a total of 100 points assigned so Best Lifetime Speed represents 50 of those points (50% of the decision), Best Speed at today's track represents 30 points (30% of the decision) and Best Speed Distance is set to 20 points (20% of the decision). When turning a factor on and assigning a value to that factor think about how important it is to you before giving it a point value. As you turn factors on and adjust the point values you will see the horse's rankings change instantly. The computer is recalculating every time you make a change. Click on the horse's name for more information or to scratch the horse. Scratch button to remove the horse from the screen. Once you have turned on some factors and assigned values to those factors you have created a Mix. You would typically create a unique Mix for different race types. The Mix you use to handicap a 6 furlong claiming race on the dirt at Churchill Downs would be different from the Mix you use to handicap a 1 1/8 Mile Stakes race at Saratoga on the turf. You would be using different factors relevant to those race types. You can create and save as many Mixes as you would like (SUBSCRIBERS ONLY). To recall a saved Mix and apply it to today's race simply select a Mix from the drop-down menu. The settings for that Mix will instantly be applied to the new race. When you apply settings that worked on a similar race in the past it will help you accurately handicap the same type of race in the future. As a subscriber there are a few resources available to you to help you create accurate Mixes. The first is the historic race page where you can look at past races to help you discover what factors worked before and to test your mixes against past results to see if they would have been profitable. A quick way to create a Mix with the help of the computer is to use MixMaker. MixMaker uses race results from previous races, and by using sophisticated artificial intelligence, it will try to create a Mix that would have accurately predicted the race. Once you know the proper settings to handicap that type of race you can save them and apply them to future races. 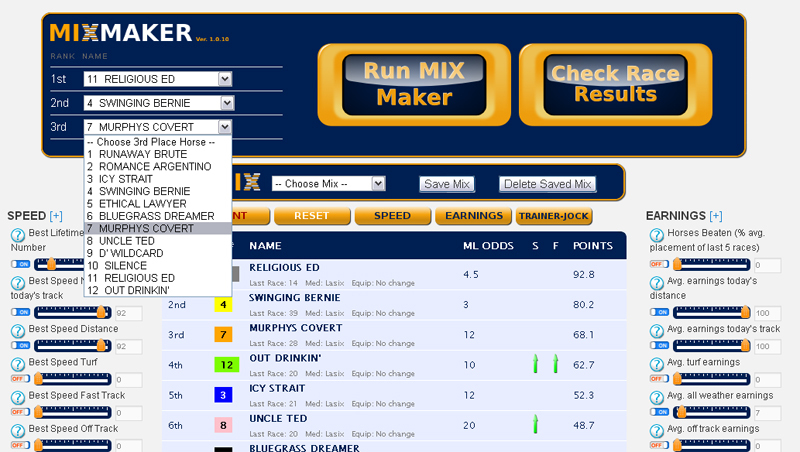 For example, if you were to select a 6f Claiming Race at Keeneland that ran yesterday, you would be able to input the top 3 finishers into the program, hit the "Run Mix Maker" button, and then see the settings needed to predict that result. Save those settings as "Keeneland 6f Claiming", and the apply them to the next race that meets those conditions! Another way subscribers can get started quickly is by using the MixLibrary. Users can submit Mixes to the library that others can use. You can search the library to find a Mix for the type of race you are handicapping. Once you have started using Betmix to handicap races you will see how easy and accurate it really is. We are here to help you with any questions you may have and look forward to assisting you.